Check out this really cool drone video of VIA 15 aka the Ocean crossing the Tetagouche River south of Bathurst, New Brunswick. François Foulem does some really good camera work with his drone - steady, clear video. Nice job! 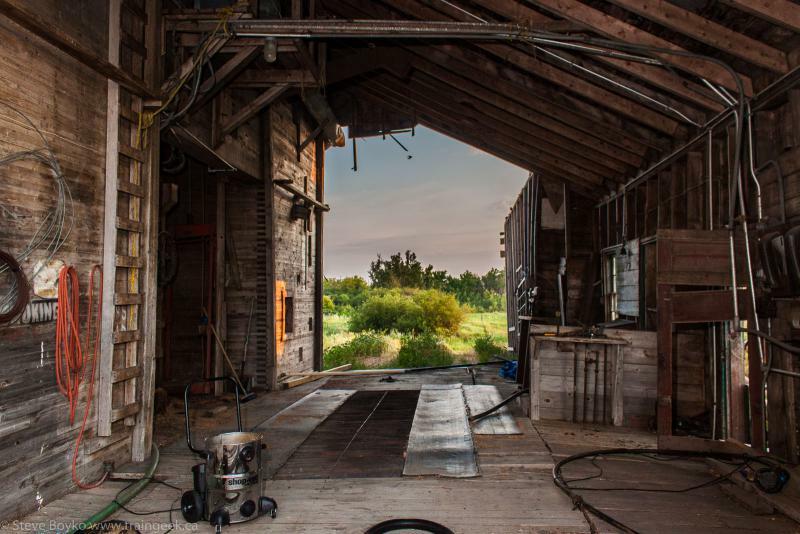 On August 4 I took a "wee" grain elevator trip as part of my 2014 photography project (you've visited www.manitobagrainelevators.ca, haven't you?). 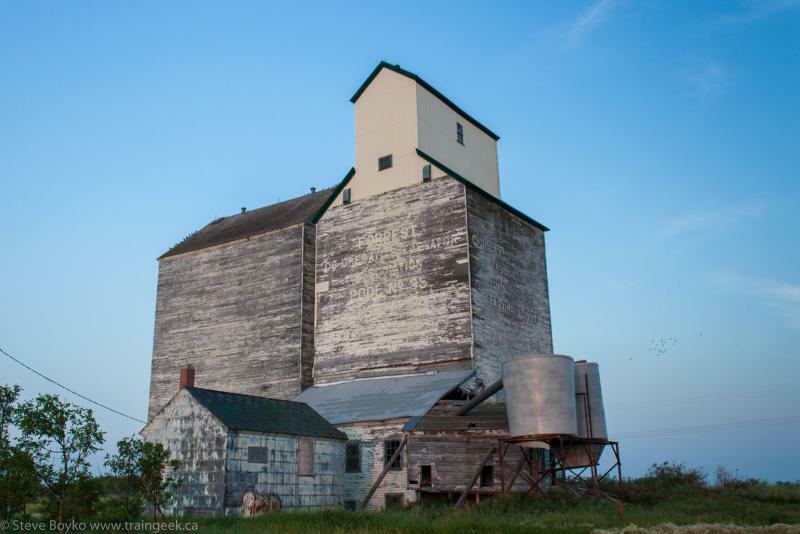 I only had Sunday morning and I had an errand to run, to drop off a print to the owner of the Mentmore grain elevator in thanks for him showing me around. 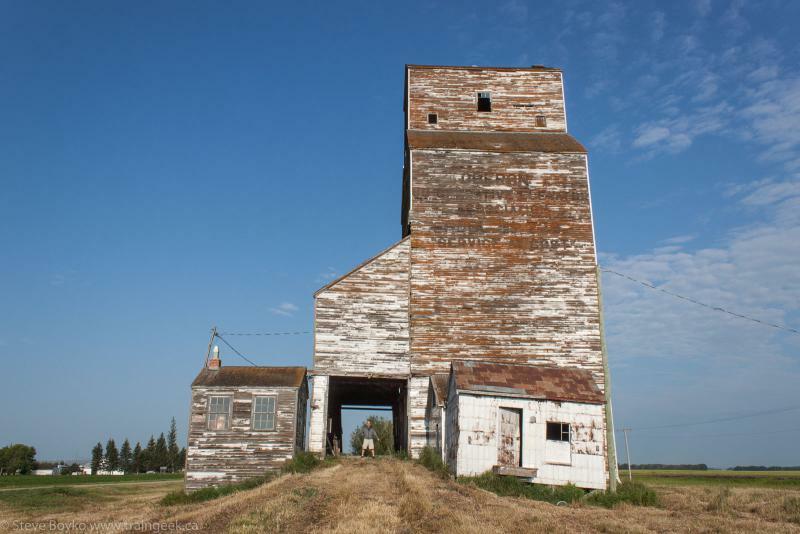 I figured I didn't have much time so I really only planned on seeing one new-to-me elevator, in Justice, Manitoba. I made a spreadsheet to plan my trip (of course! who wouldn't?) and here it is. You can see I intended to take the Trans-Canada west, then north to Justice, then visit Mentmore, then revisit a few elevators on my way out. I had a dwell time of 30 minutes at Oberon because I wanted to revisit that fantastic elevator in detail, and I planned on 30 minutes at Harte to hopefully catch a train passing the elevator on the CN Rivers subdivision. I woke up bright and early around 03:15 and hit the road a few minutes early. 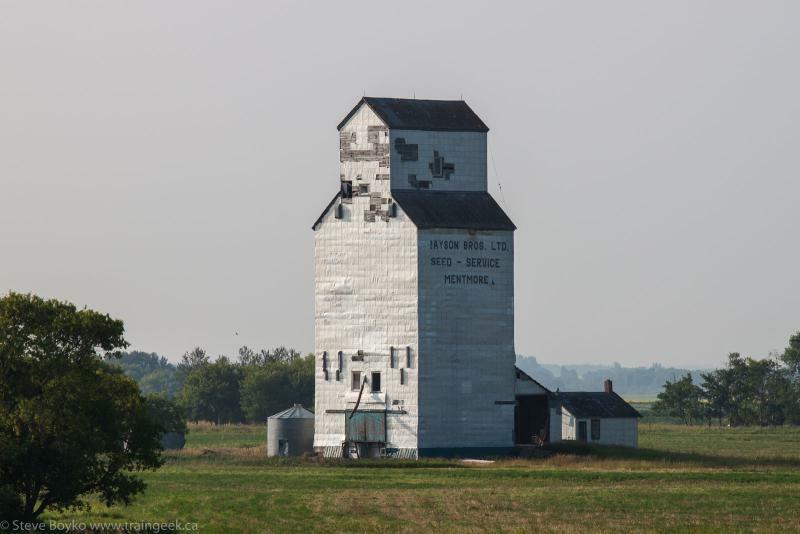 After passing Portage la Prairie, I noticed I was well ahead of schedule so I made a quick decision to add two more elevators to my list. 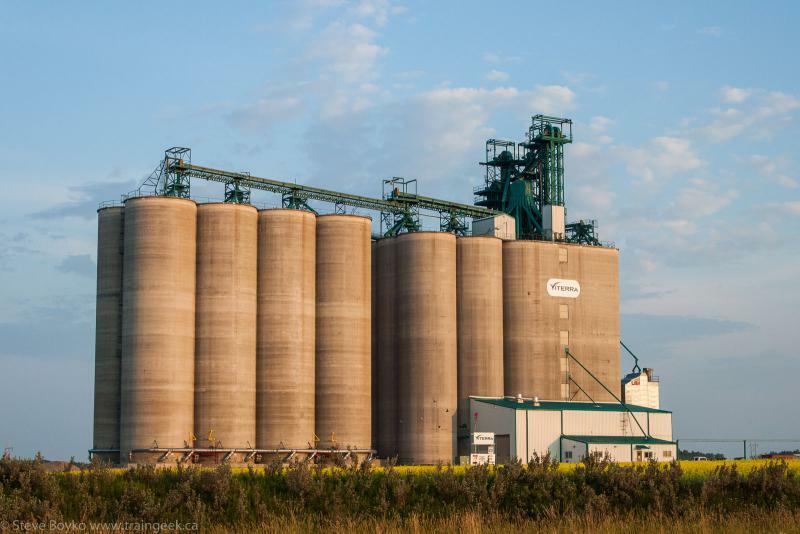 There is a new Viterra elevator just north of Brandon on the Rivers subdivision, as well as the old Manitoba Pool grain elevator at Forrest. I had thought about including them in the list before but I didn't think I had enough time. After a quick stop at the highway Esso for fuel and the local Scottish restaurant for drive-through breakfast, I headed north on highway 10. 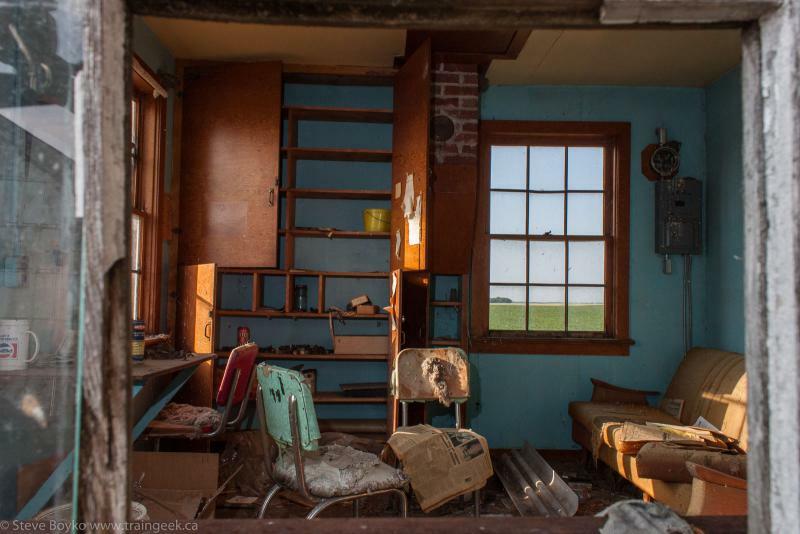 I came across the old Pool elevator in Forrest quite easily. Forrest with a new top!? I spent the next 15 minutes photographing the elevator. It is a bit of an odd duck in that the top has clearly been replaced / renewed while the rest of the elevator, and the annex, is quite weathered. It does appear to be maintained as it is not very overgrown and there is an open Shop-Vac in the truck bay. Back on the road, I quickly spotted the new Viterra facility and took a few photos from the highway. After 17 minutes of driving, I found Justice. 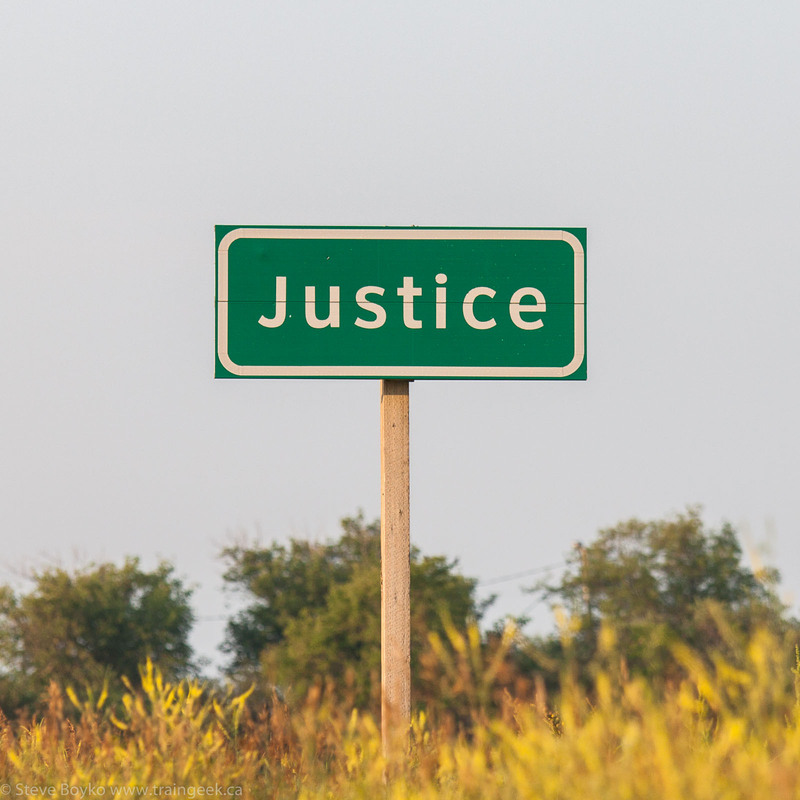 Been searching for justice? Here it is! Justice has a classic Manitoba Pool elevator with a largeish annex. The single-track CN main line runs past it but there is no siding for the elevator any more. I spent half an hour photographing the elevator and a few scenes around. I was hoping a CN train would happen along but there was no sign of any rail traffic. There was some nice scenery, though. Thanks for the photobomb, birds! I carried on east to Brookdale and territory I had covered before on May 31. 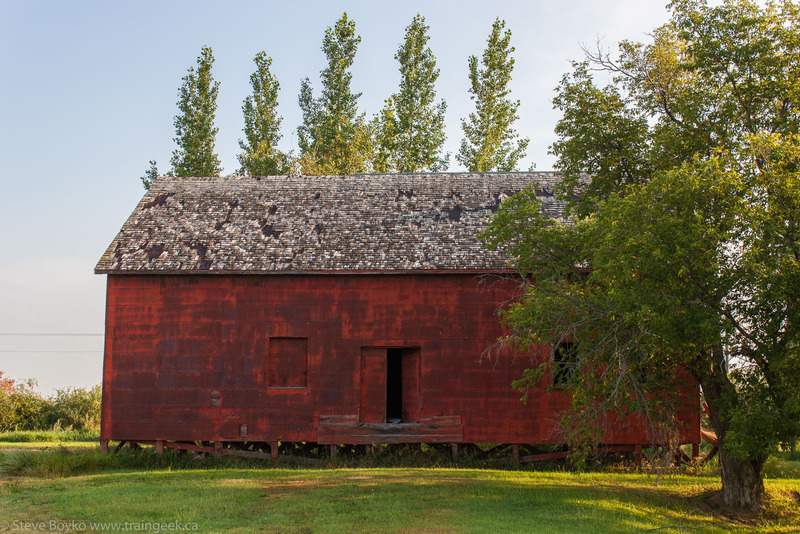 I stopped in Brookdale to photograph the old grain warehouse, a classic structure I had intended to photograph the first time but ended up forgetting about! The sun was not in a great position but I did what I could. From there I headed north to Mentmore. I dropped the photo off and took a few photos of the elevator from afar. After that it was a short drive to Oberon. I just love the weathered, forlorn look of this elevator. I spent about 20 minutes photographing it from various angles. Here's the office, viewed from outside. From there I headed directly south to Harte. I was about 20 minutes ahead of schedule! There was no rail action imminent but I did see a crop-duster working nearby, so I went over and photographed it for a while. 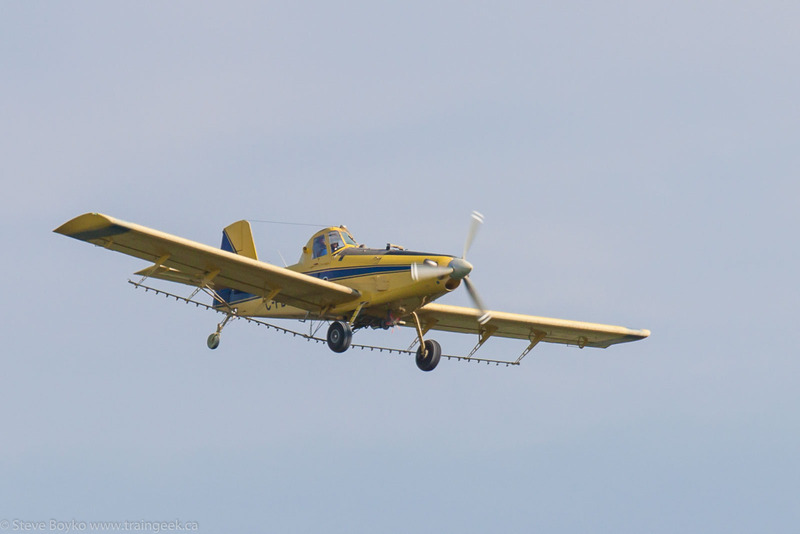 The plane is an Air Tractor AT-402B, a plane custom made for spraying. 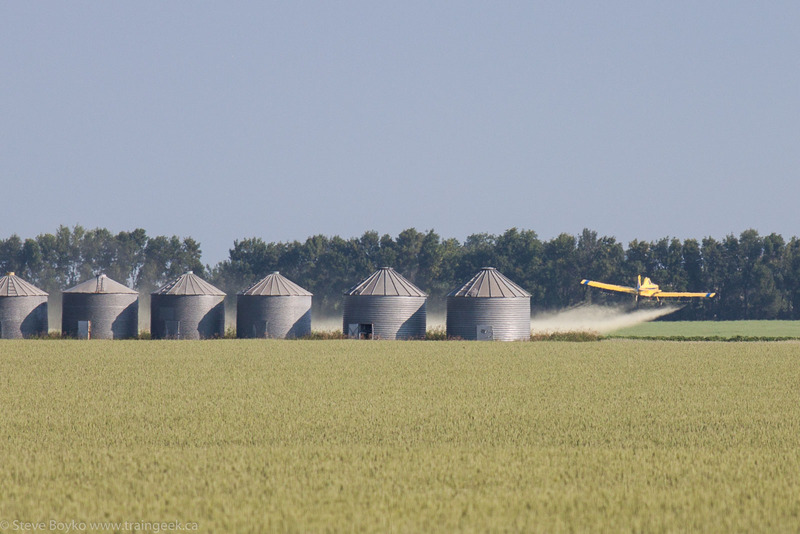 It is part of the fleet operated by Ken Kane Aerial Spray Ltd. out of Minnedosa, Manitoba. My scanner crackled to life with CN 114 calling the approach to Harte around 09:20. An eastbound would look great in the morning sun but it would be a "going away" photo for the grain elevator, as the elevator is east of the overpass I was shooting from. I had my old Canon S3 set up on the tripod to record video while I shot stills with my Canon T1i with the 70-200mm f/4 lens. That overpass sure rumbled when those containers rolled by underneath. It was almost scary how close they were! 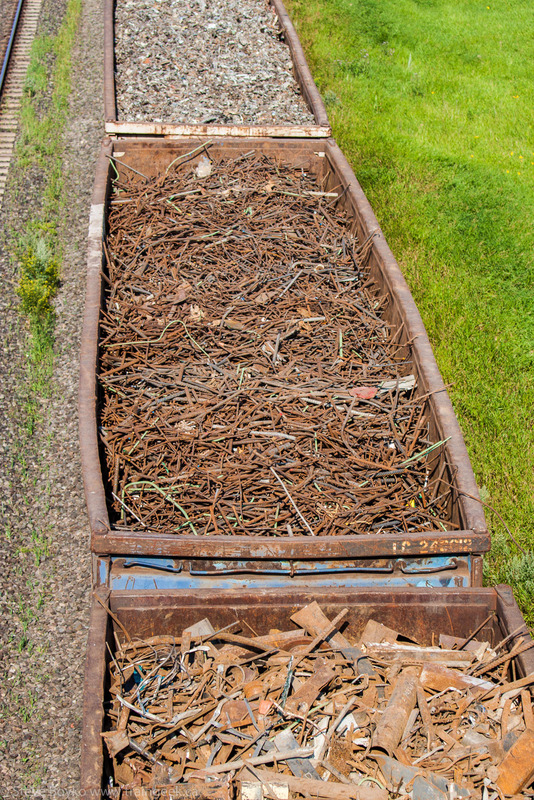 How would you like your scrap steel? After CN 114 went by, it was quiet for a while. 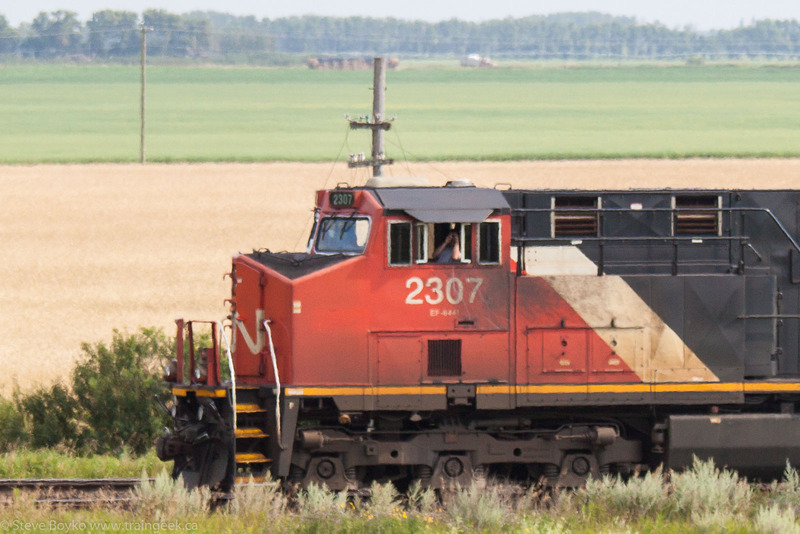 I heard two CN trains exchanging inspection reports as they passed each other, and then I heard CN 403 call a diverging signal at Harte as they took the siding at 10:00. They crawled past the elevator, with CN 2307 / CN 8009 / CN 5480 / CN 5548 for power. When processing these photos, I was surprised to see that the conductor was photographing me! 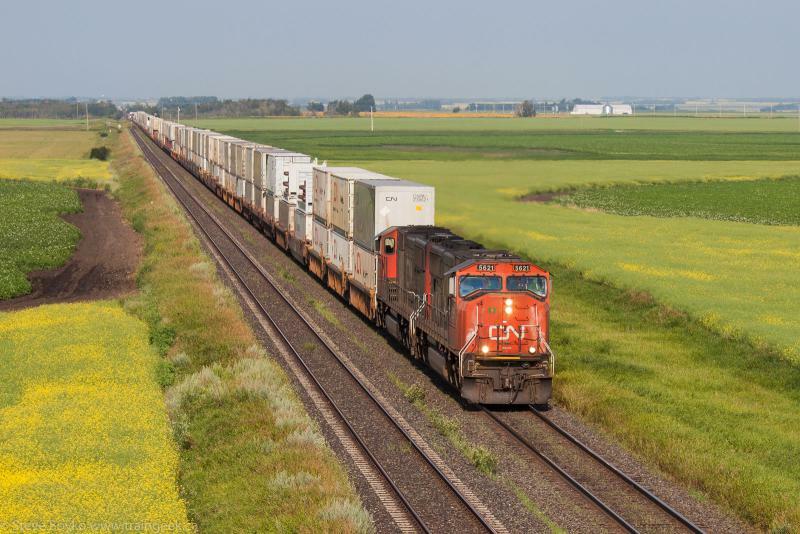 The reason for taking the siding became apparent when CN 106 called the approach to Harte. I set up to record the meet. 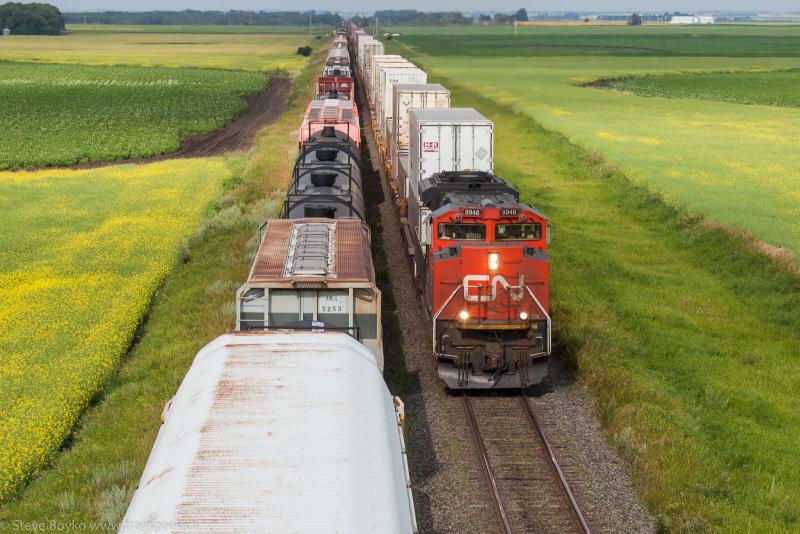 CN 106 rumbled past with CN 8948 as the sole power on the head end, and CN 8944 as DPU in the middle of the train. 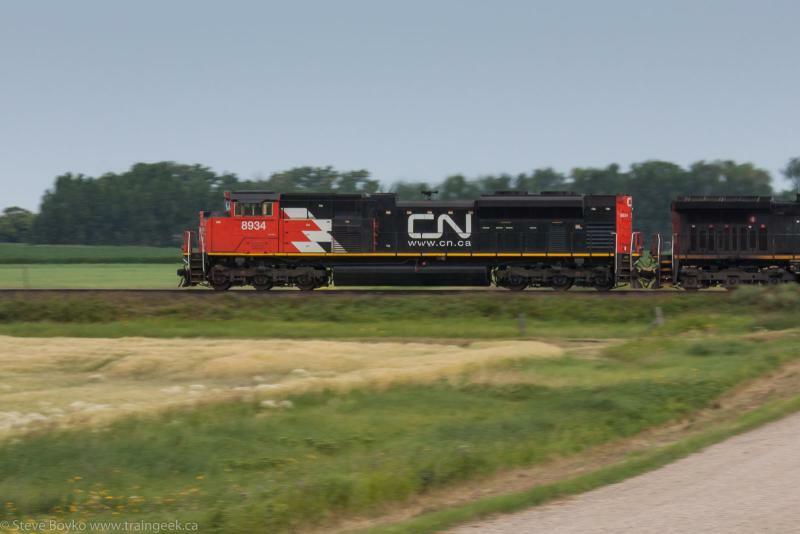 CN 403 was rolling before 106 was past, anticipating a quick alignment of the switch so they could leave, and they got it and were on their way at 10:12. So was I, as my schedule said it was time to leave! I passed Oberon again and took highway 5 south to the Trans-Canada, then headed east toward Winnipeg. 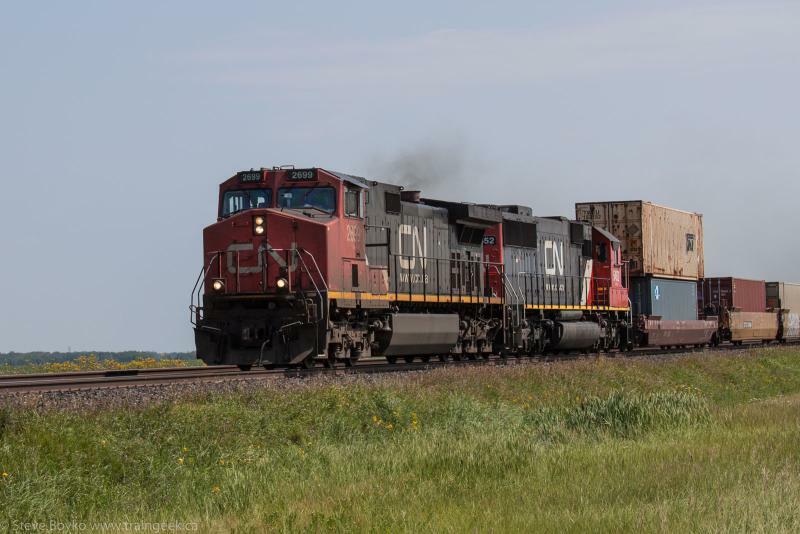 As I passed MacGregor I saw two consecutive CN westbound trains. In both cases I pulled over to the shoulder and photographed them from the highway, as I didn't have time to do any more than that. Passing Bloom, I noticed that poor CN 114 was stopped there. Clearly they didn't get too far after Harte before having to stop for westbound traffic. Between Bloom and Portage I saw another train, with CN 8934 and CN 2528. I went around Portage and kept going. 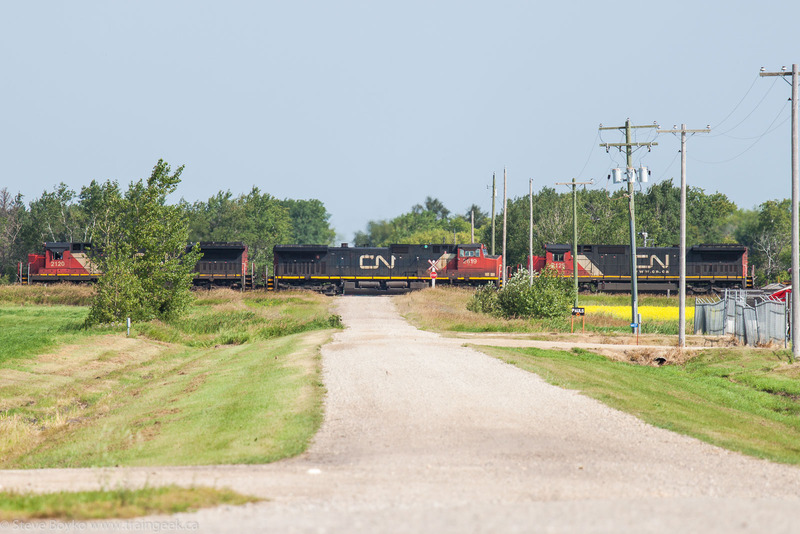 I saw I was making good time so I cut north to the Rivers subdivision just before Headingley, so I could drive alongside the CN tracks between mile 20 and mile 11 and hopefully catch just one more train. 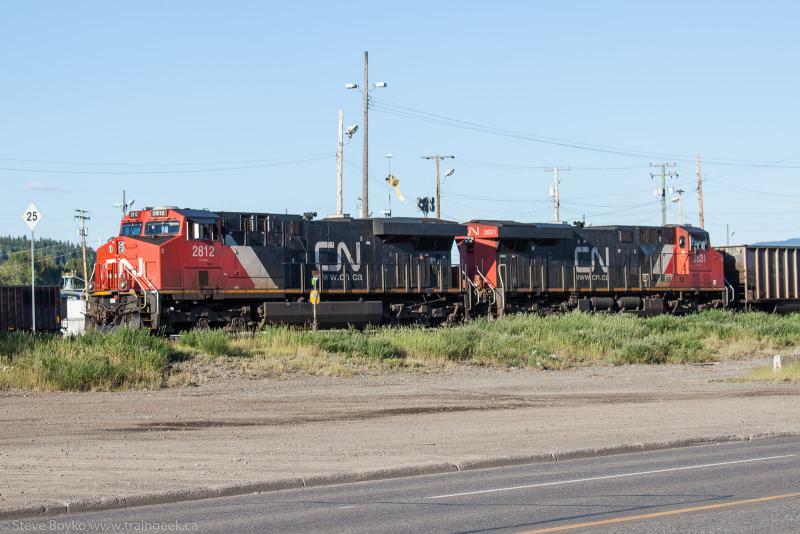 I met Brian Schuff at Diamond and we saw a CN train carry on westward with CN IC 2699 and CN 5452 on the head end and CN 8846 pushing on the rear. Not bad for a (long) morning's work... 3 new grain elevators and 7 CN trains. PS if you're interested in purchasing any of my prints, my best photos are available on pixels.com. If there's one you want that's not there, contact me and we can work it out. Omnitrax has announced that they are suspending plans to ship crude oil by rail to the port of Churchill, Manitoba. 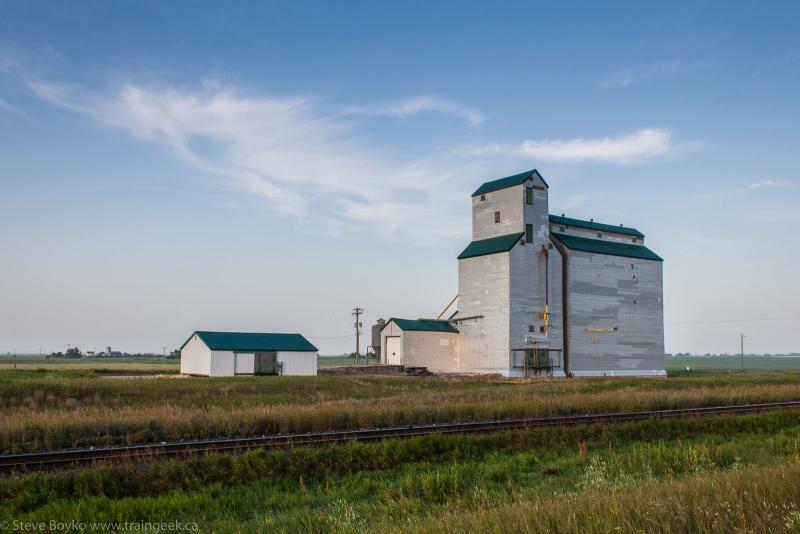 Citing increased traffic in grain and construction materials, as well as input from various groups, president Merv Tweed said "we decided it wasn’t necessary or in our best interests to pursue this any further." Tweed said they will have five to seven shippers using the port to ship upwards of 700,000 tonnes of grain, up from four last year shipping 640,000 tonnes. One wonders if the recent derailments on the line were a factor too. You might remember the almost month-long closure in June. 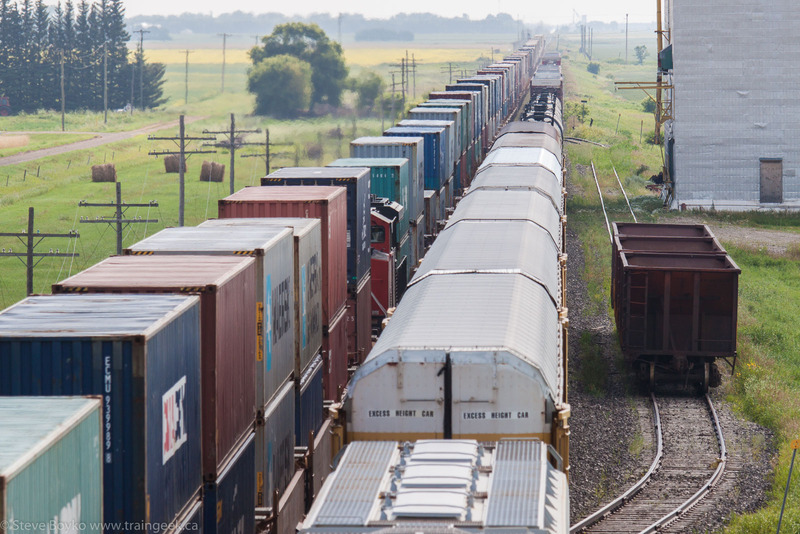 There was another derailment this week that has VIA ceasing through service between Winnipeg and Churchill until the line is clear. VIA is still running between Thompson and Churchill, and between Winnipeg and The Pas, but not through the whole line. I understand the derailment is near Cormorant, about 35 miles northeast of The Pas, and eight grain cars are on the ground. Omnitrax left the door open to revisit crude oil shipments, but I seriously doubt they will be able to go through with any oil shipments without some serious investments in the line. 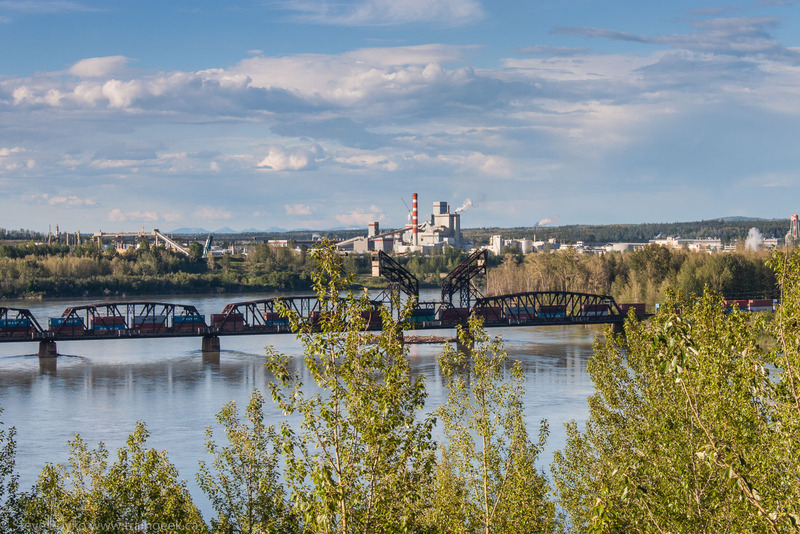 I feel like I should have some clever Star Wars-like title reference, like Railfanning Prince George - The Skeena Comes Back or RPG - Now With No Ewoks. Anyway. Part 1, part 2, part 3 have trickled out and here is part 4, the grand finale. 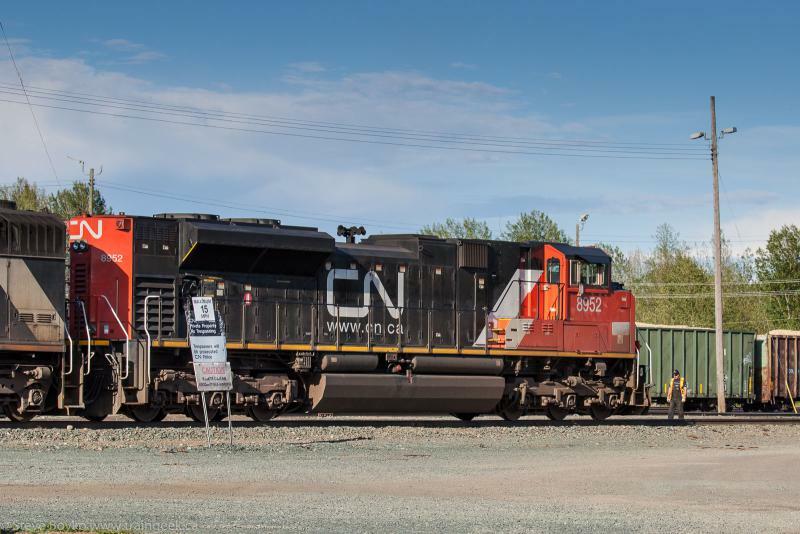 After visiting the Prince George Railway and Forestry Museum (photo gallery here), I had some supper then walked over to the CN yard to await the two Skeena trains, VIA 5 and VIA 6. Of course VIA doesn't call them the Skeena any more. In their infinite wisdom VIA dropped the names from most trains several years ago, and now it's the "Jasper-Prince Rupert" train. 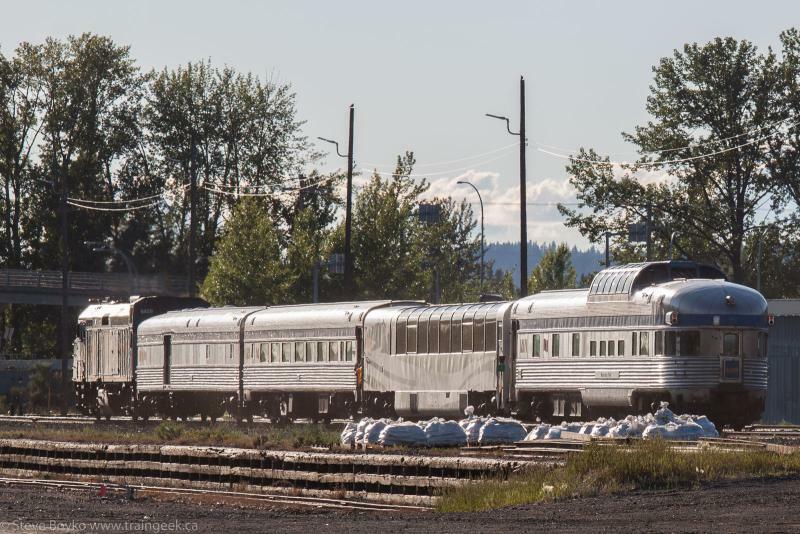 I'll still call it the Skeena because passenger trains should have names. I guess I could call it the Rupert Rocket as some call it. Anyway, I walked into the very nondescript VIA station to see if either Skeena was expected soon. The agent told me that they were both late but the one coming from Jasper was not very late. I asked it I could photograph it from the platform and she said, "as long as I don't see you," with no humour. So, no platform then. OK. I walked to the western end of the yard and saw GP9 CN 7276, slug CN 262 and GMD1 CN 1440 doing some work a few tracks beyond a snoozing coal train. 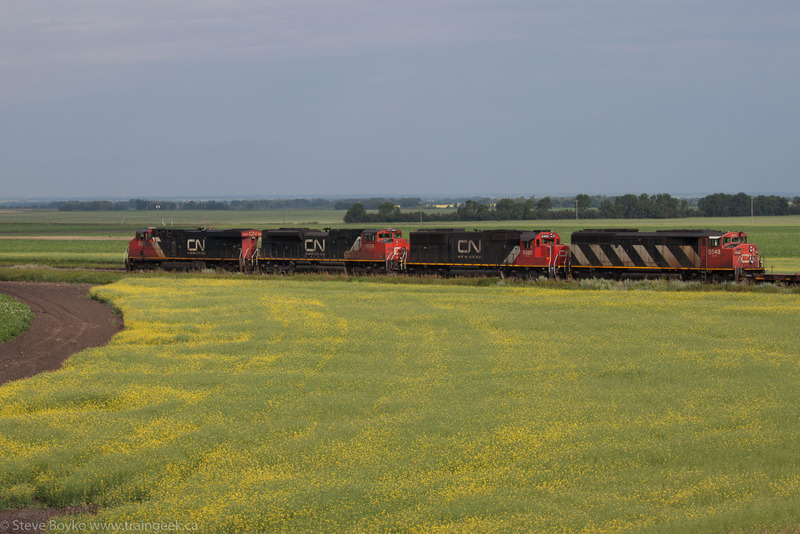 The coal train had CN 2812 and CN 2831 for power, two of CN's new ES44AC engines. I started walking back to the VIA station but the Skeena had already arrived and was passing me! Not my best railfanning moment. They pulled to the end of the yard, then backed into the pocket track and parked the train. A taxi quickly pulled up to take the crew off. The engine was left idling away. Just FYI the consist was VIA 6459, baggage VIA 8613, coach VIA 8116, Panorama Dome Car VIA 1722, and VIA 8717 Waterton Park. I ended up going to the overpass over the north / west end of the yard and photographing the yard from there in the sunset light. The other Skeena was super late and I did not see it arrive. I did see one more train before retiring, a pair of engines on a grain train that pulled in from the west. CN 2205 and CN 2181 were the power. 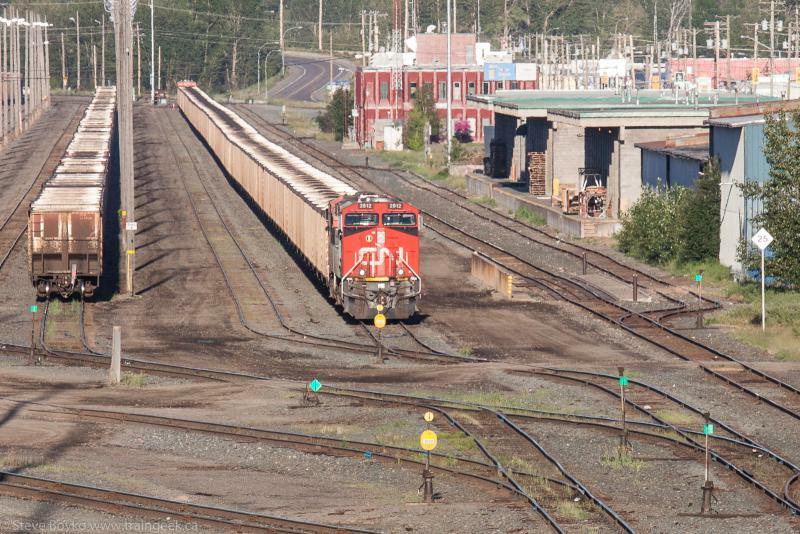 Next morning (June 25), the two Skeena trains were nose to nose in the pocket track, as they were a few days earlier. 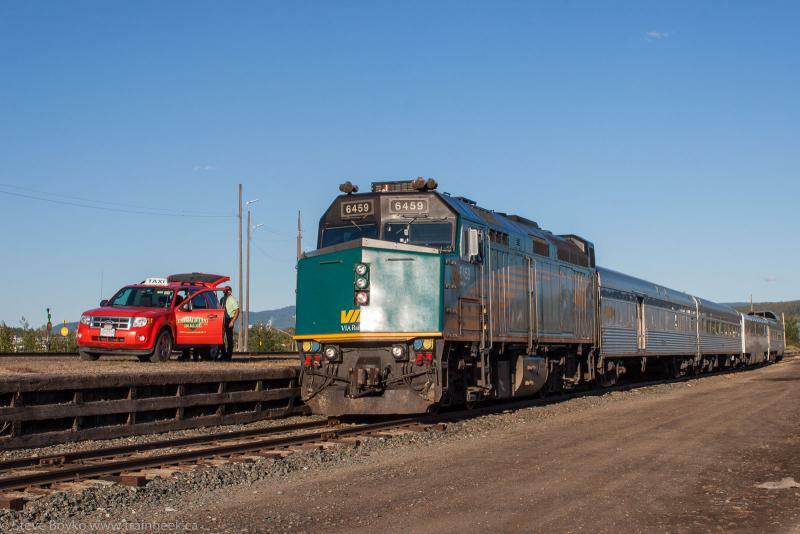 The Prince Rupert Skeena had VIA 6420, baggage VIA 8606, coach VIA 8135 and VIA 8703 Banff Park. I didn't have time to fiddle around with getting a nice shot from the overpass so all I could do was take inventory and get to work. 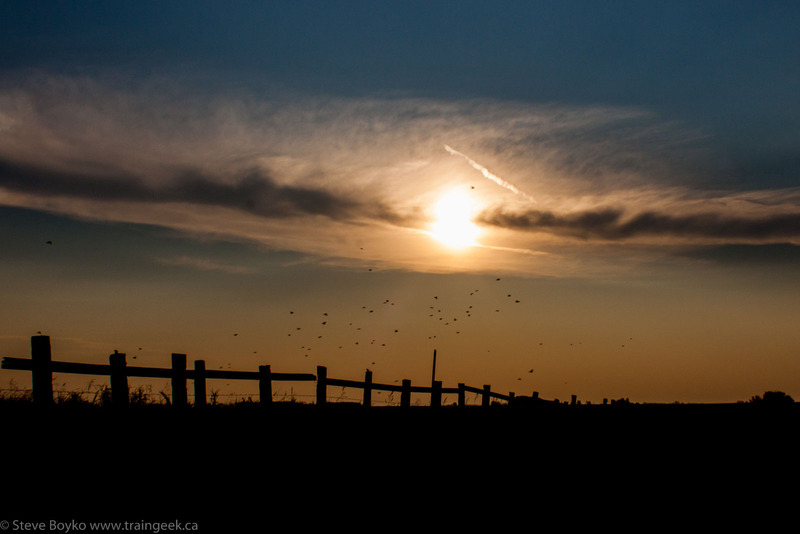 That evening, I decided to go visit the former BC Rail yard. Now, I have no experience with BC Rail so I don't know what it used to be like, but it seemed very.. quiet. There were a lot of cars in the yard but no power other than an arriving CN train with CN 2164, CN 5463 and CN 2235. 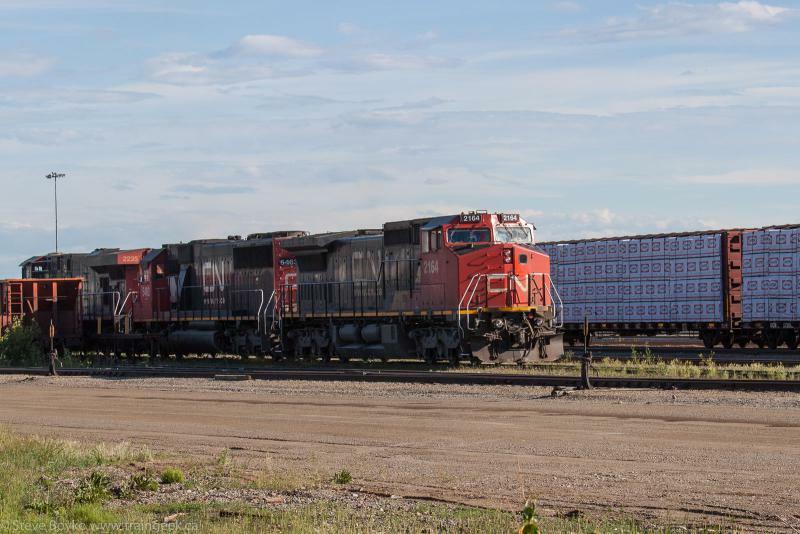 After driving around for a bit, I returned to the main CN yard and found CN 8952 and CN 5511 at the head of an eastbound container train. 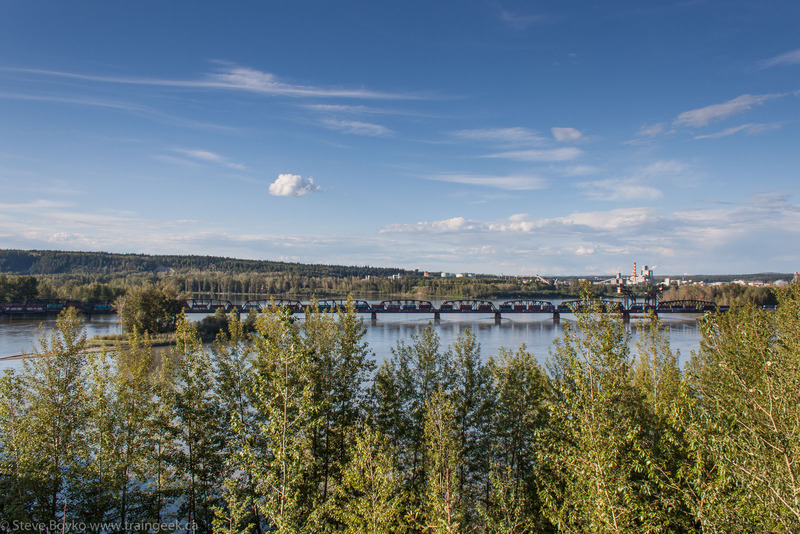 I decided to shoot them on the bridge and captured a few views of the train crossing the Fraser River. 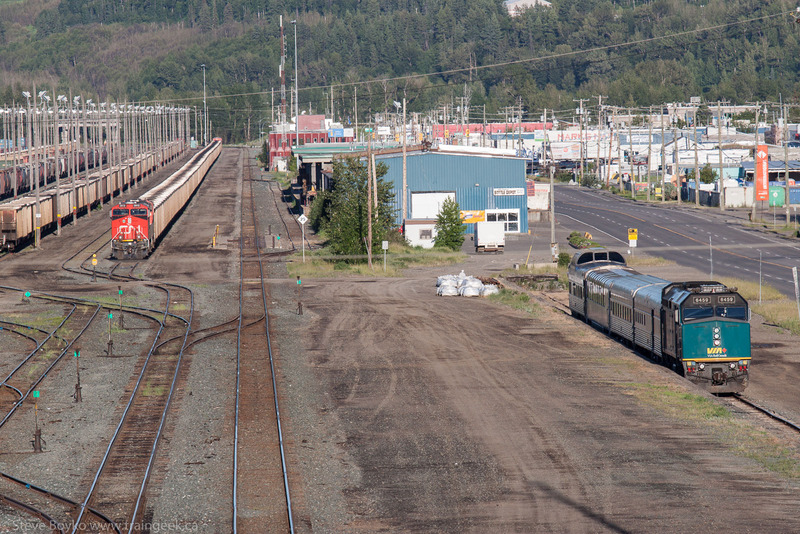 That was the end of my railfanning in Prince George, as my flight on Friday was early in the morning. 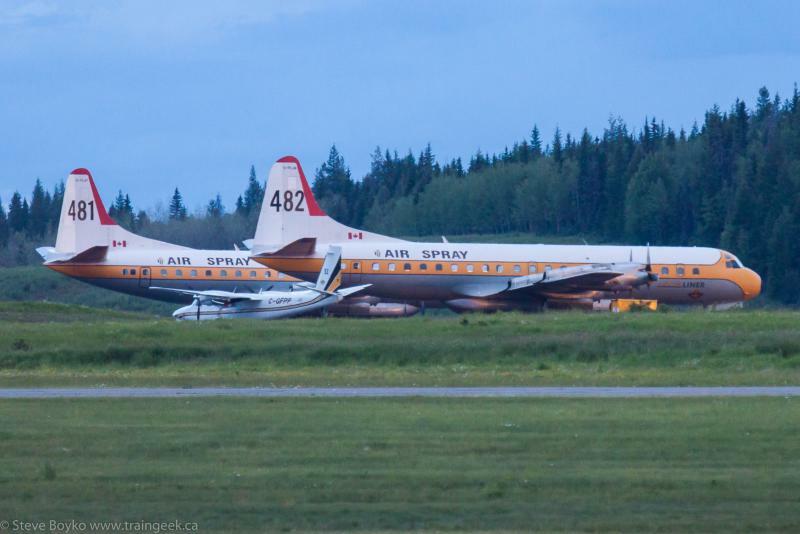 I did see a pair of L-188 Electra fire fighting planes at the airport. These are beasts! Check out this YouTube video of an Electra in action. That was it for Prince George. 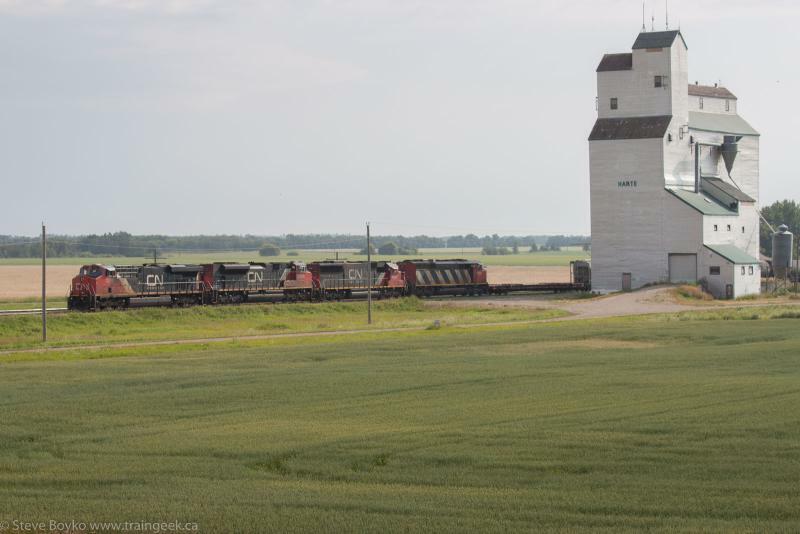 I hope you've liked the series... now I'll get on with reporting a few grain elevator trips that included some trains. 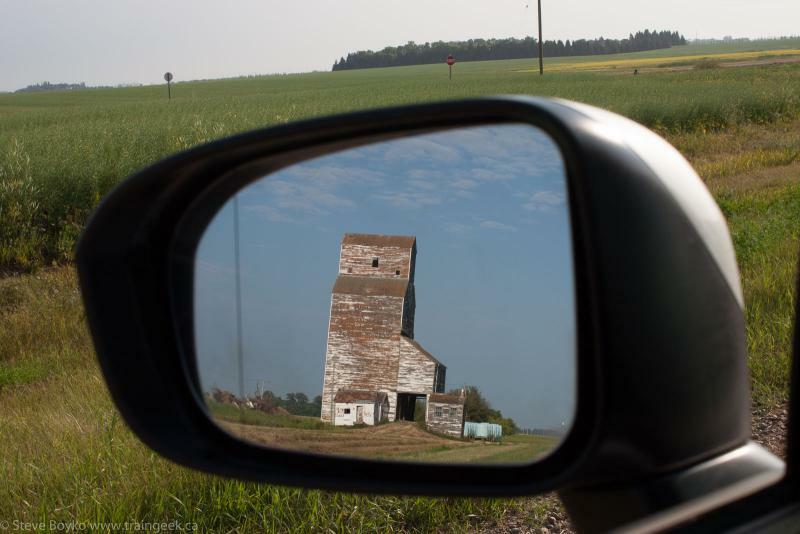 If you like grain elevators, please visit my new site www.manitobagrainelevators.ca where I am posting elevator photos on a pretty regular basis. Oh, and hey! If you're on Facebook, why not follow TraingeekImages and get a photo or two every day?